We decided to offer our wheat grass powder in capsules because it is the freshest and highest quality way to offer this in a pill form. There are absolutely ZERO fillers or binding agents. Just great Organic Wheat Grass Powder!! 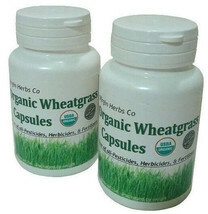 (Our wheatgrass capsules are made using gelatin capsules). Our amazing Organic Wheat Grass Capsules are always fresh and made from the highest quality Wheat Grass! Our Wheat grass Tablets are USDA Certified Organic with Zero Chemicals, wonderful mild slightly sweet taste, always fresh and lustfully green! 2-4 Capsules 2 times daily. ALL of our product are sold with a 100% money-back guarantee. If you are unsatisfied for any reason please contact and let us know about it! WE ALWAYS COMPLY WITH ALL FDA POLICIES. THERE IS NO SCIENTIFIC PROOF THAT THIS SUPPLEMENT WILL HEAL OR REVERSE ANY ILLNESS, DISEASE, OR DYSFUNCTION.THIS SUPPLEMENT IS NOT BE FDA APPROVED FOR MEDICAL TREATMENT. PLEASE CONTACT YOUR PHYSICIAN PRIOR TO USING. If you suffer from health issues, are pregnant or breast feeding you should consult your physician prior to use.